This is a story about dying and what it means to let go. Faced with the ultimate choice, torn between your lost life and an unknown future, will you be able to take the Grim Reaper’s hand and pass over to the Other Side? Or will you be doomed to wander the world forever, weighed down by the chains of your past? It’s 25% off until October 4th! 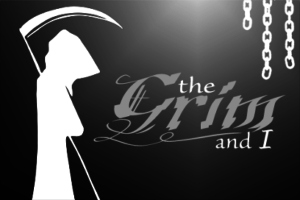 The Grim and I is a unique 155,000 word interactive novel by Thom Baylay, where your choices control the story. It’s entirely text-based—without graphics or sound effects—and fueled by the vast, unstoppable power of your imagination. How will you react to the discovery that you are dead? When the Grim Reaper offers you a way forward, will you take it? Or are you still clinging to the world that you left behind? Begin the most important conversation of your afterlife as you take on Death in a story that will redefine the meaning of Choice; where the game reads you as much as you read it and where your greatest enemy is yourself. Challenge your instincts; fight your temptations; and embrace that most primal of fears. Choose your life, your love, your job and then make the hardest choice of all – to let it all go. • Leave your body and bear witness or try to interfere as life continues without you. • Meet, befriend and customise your own personal Grim Reaper! • Choose your perfect life, and then see if you can choose to let it all go. • Identify and overcome the unfinished business that binds you to this world. Love, fear, rage or ambition; your choices will reveal the truth! • As the chains begin to cover your body, will you be able to fight free, or will you succumb to your vices and stay haunting the world for eternity? • Forget everything you know about interactive fiction as the Grim Reaper questions your choices and challenges your motives, blurring the lines between fiction and reality. • Explore the concept of death and the ideas of loss and letting go in the company of your Grim guide. Thom Baylay developed this game using ChoiceScript, a simple programming language for writing multiple-choice interactive novels like these. Writing games with ChoiceScript is easy and fun, even for authors with no programming experience. Write your own game and Hosted Games will publish it for you, giving you a share of the revenue your game produces.